Club Gives Podium Time to Four Speakers: Scholarship Winner, Cochise Serving Veterans, ADOT and "Mr. 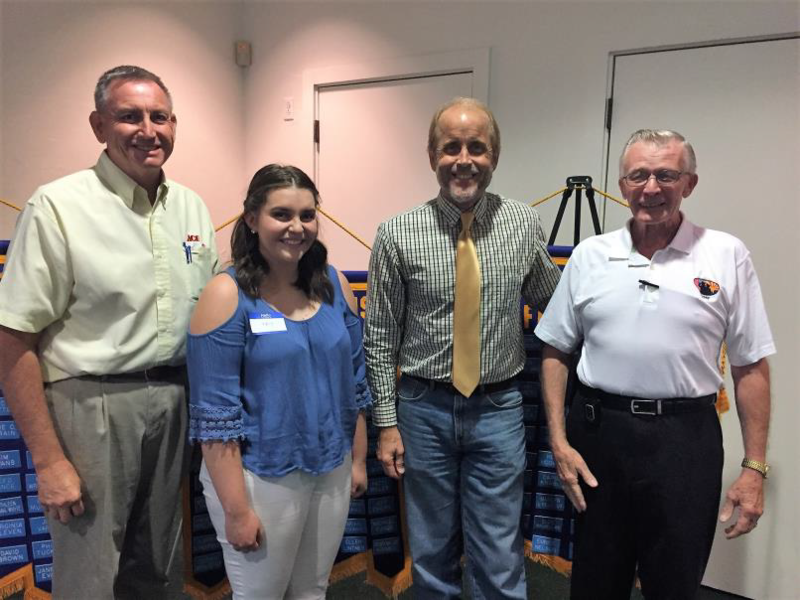 Ace Hardware"
Buena HS graduate Macy Maine thanked SV Rotary for her scholarship which she will use to further her studies in political science at NAU this fall. Local Veterans advocate Harry Bowen shared his organization’s plans for hosting the 4th Annual Cochise Serving Veterans’ Resource Fair, Friday, August 18 from 9 AM to 2 PM at Rothery Educational Services Center (Apache Middle School). The Resources Fair is one of three services provided to veterans offering employment, behavioral health, housing, health care, pet care, haircuts, legal advice, clothing, showers, meals and over 50 providers. Bowen’s volunteers, headed by Mary Martinez (520-678-0096 or vrfchair@gmail.com) always welcome new volunteers. For information, contact Nita Freeman at ccsdvolunteer@gmail.com. Featured speaker Doug Nick, Assistant Communications Director for Arizona Department of Transportation (ADOT) Community Outreach addressed the audience with ADOT plans and improvements in "customer service" and the public’s perception of what ADOT is doing for AZ residents. A veteran news broadcaster, Nick joined ADOT in 2016 and began his presentation with a brain teaser exercise. He asked the audience to imagine a bus driving down a highway and the bus made its first stop to pick up 4 passengers. At the next stop the bus picked up 8 passengers and at the third stop the bus picked up 12 passengers. What is the age of the bus driver? The only correct answer is to give your own age because everyone in the audience is the bus driver and has nothing to do with the perception or mis-perception that the number of stops or the number of passengers has anything to do with the age of the bus driver. He continued by describing the AZ Management System employed by ADOT to improve service, shorten wait times at busy ADOT locations, like Sierra Vista, and save taxpayer dollars spent by ADOT. In 2016, 7,300 people were served daily at ADOT service locations representing $44,000 in customer savings. Everything from expanded hours of operation at the busiest offices to reduce wait times, to accommodate the public’s need for pre-work hours, improved road testing scheduling and social security card replacement. The "silent call," is a technique being used to allow customers to indicate the purpose of their visit to an ADOT location at the beginning of the visit instead of waiting until your number is called only to find out that a customer’s request could be answered immediately.